Need help to make careers decisions? Want the skills needed to find and keep a job? Want to know how to research, apply for or interview for jobs? If you're a young person the Skills to Succeed Academy can help answer these questions and more! The Skills to Succeed Academy is an interactive, online employability training that helps you to build the confidence and skills needed to make the right career choices and find and keep a job. It provides innovative methods that help you learn how to write application forms, create and tailor CVs, ace an interview, adapt to the first few days in a new job and much more! 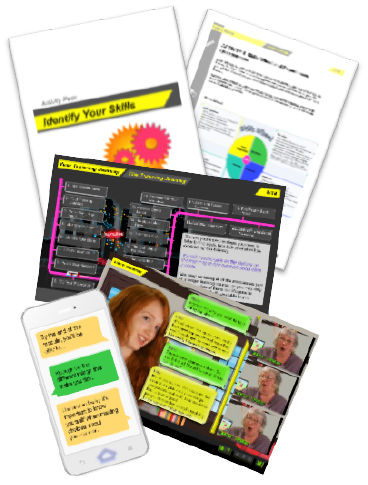 Getting a Job: 20 modules that help build the employability skills needed to find and keep a job. You and Your Career: 6 modules that help you build your skills to make the right career choices. Success in Work: 10 modules to help you build the skills you need to prepare for work, be successful in the work environment and develop in a career. You’ll need a code to use the Skills to Succeed Academy. To get yours simply visit your local Careers Centre or call us on 0800 028 4844 and say that you would like to register to use the Skills to Succeed Academy. Once you’re ready just click on the Skills to Succeed Academy image and log in.